Connector beads to connect two bracelets to look like one thick one. Personalized name beads available. They have five different jewelry lines, take a look. The possibilities are endless! Sterling Silver rings that can be worn in any combination. 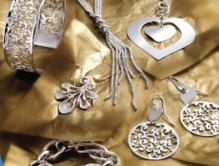 They can manufacture products in Sterling Silver or Gold. They have one of the largest collections of charms. They can make them in Sterling Silver or gold.